Are the radar scattering properties of near-Earth asteroids correlated with size, shape, or spin? 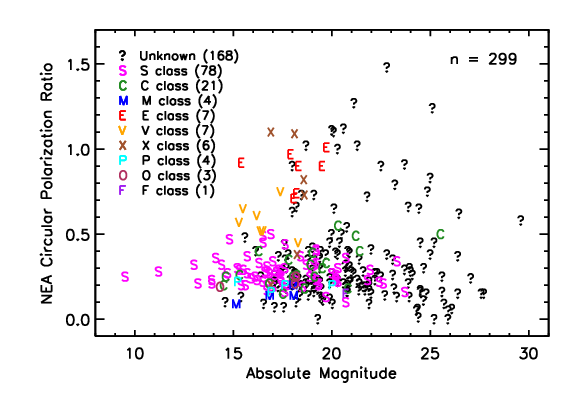 Polarization ratio versus absolute magnitude, as well as taxonomic class, of 299 near-Earth asteroids observed with planetary radar. 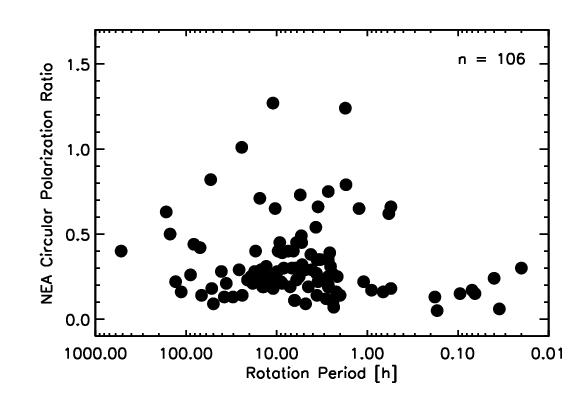 Polarization ratio versus spin rate in hours of 106 near-Earth asteroids. Why do objects with rotation periods of less than seven minutes seem to have small polarization ratios? Or is this a case of small number statistics? We have data including sizes, shapes, and spin rates of 300 near-Earth asteroids observed with Arecibo's planetary radar system. We are able to process the data and make the results available to the greater planetary community, for whom radar spectra aren't useful, but physical properties of a population of asteroids are of interest. This is an ongoing project, so expect more data to be related in publication and webapp form in 2013.